Oh boy,oh boy,how i love fluffy sweaters ! this look is amazing! :) love it! nice belt! so adorable! love your cuffs as well! That dress drapes beautifully and is really set off by your belt. Great styling! I love this wooly fluffy jumper – gorgeous.. I love anything ombre. The sweater is beautiful. Fluffy sweater so cool!! Love this look! Lovely look . I love your sweater. Bsinos. Buenas tardes….precioso dress..super lindo!! besos y buen miercoles!! I’m in love with your dress! Great bag! So pretty. I just love the colors and silhouette. I think this is one of my faves from you!The belt and sweater are sooo interesting!The skirt is just what I need and the bag..oh adore it! These photos are beautiful — and that ombre pink cropped sweater is perfect! Such gorgeous and delicate look! you always look so stunning..love it! Love your bangle & ring,nice look, very nice! Absolutely adore your belt and cuffs! OMG You look fab!!! Can i feature you among my november fave outfits? Let me know! Your blog, your style and your pictures is gorgeous! wish I could pull off the maxi skirs, I’m way too short for them.. and that top is awesome, love the belt detail.. très cool! That maxi skirt is really lovely!! love that skirt! !great outfit dear!! A snakeskin belt is the perfect accessory to any outfit. I love the colors of that sweater, and the belt is an awesome extra pop! You have the greatest skin I have ever seen…..
you look lovely darling, very fall inspired! absolutely love your revamp of how you wore your belt. Loving the maxi skirt, it just perfects the outfit. Have a perfect Thursday honey. wow, ı realy like the belt detail…u look beautiful..
Amazing look!! You really have a great fashion sense. I adore your outfits!! And love the way you wear the belt. Fantastics pics and fantastic outfit! You have such great style!! I am a new follower and thank you for your comment on my blog. Please come back and visit again it would be great if you could follow me as well if you like my blog. Beautiful turtleneck and great belt! U look so pretty hun!! Dear thanks for visit my blog! I loved it here and I’m going! The outfit is very chic! love your snake belt, wonderful! <3 you are so pretty, my dear! I love your black and white photos, you remind me of Audrey Hepburn. Another awesome outfit. I love it paired with the long skirt and the color of that sweater is amazing. I love this!! I love the colors. 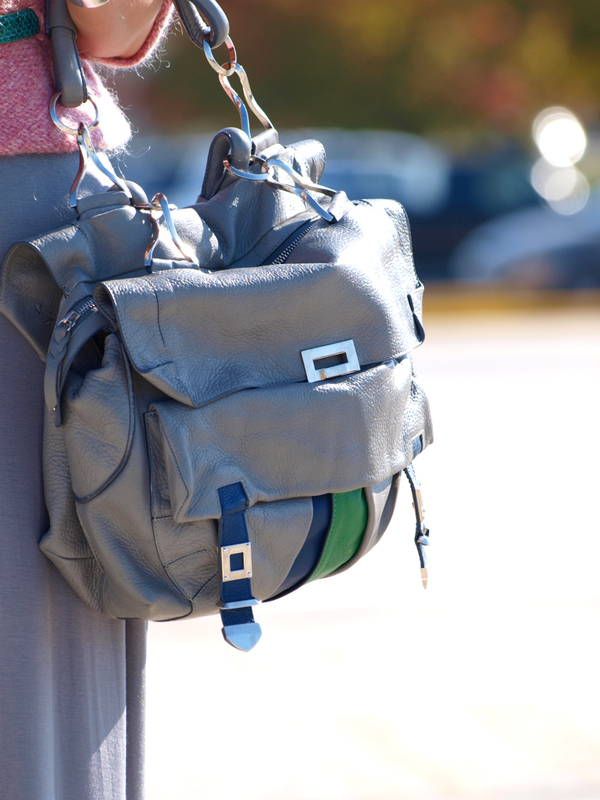 Love that little shot of teal in your outfit! And the long skirt is so great with a sweater! I just shot a girl in a similar outfit over at http://On-PCH.com today! I love this outfit, your blog is great! Pink colour suits you very nice. I love these Autumn leaves too. Pretty photos. love how you mix the colors! Gorgeous! Love that sweater and belt combo! So cute! you have such gorgeous style! serious talent. love your outfit again my dear! the maxi skirt suits you really well! love this outfit absolutely love your cuff and ring! Love this look! Beautiful pictures too. Beautiful! This outfit is movie star status! How beautiful! I love the skirt. This whole look is so soft and has nice flow. I really like the belt and glasses ! And your sweter is so cute..
you have such an incredible style I am your new follower via google friend connect hope you can follow me too so we can keep in touch hope you have a great day! What can I say? Your posts are always better then the previous ones, you reach PERFECTION!!!!! Really a nice and so elegant outfit! 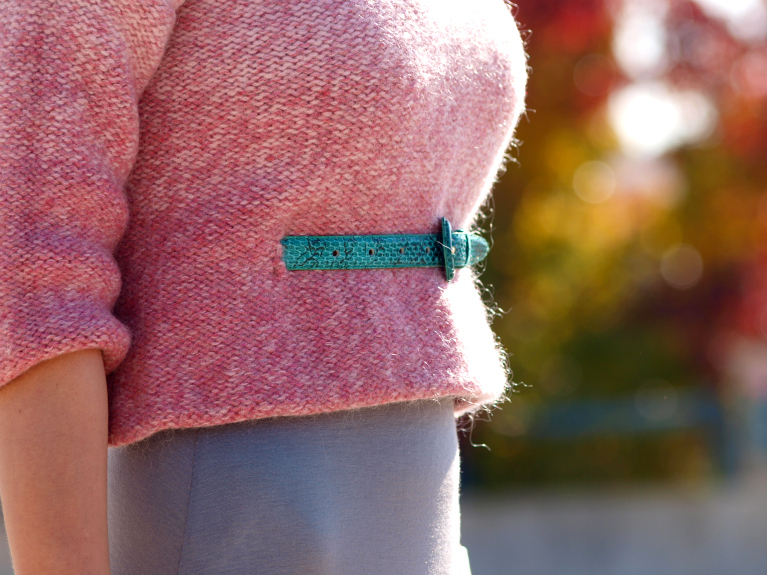 The way you placed the belt on that sweater…wow!!! The BAG is also amazing!!! We are wearing the same hair do in our posts! great pictures…you are so gorgeous!!!! your outfits adorable..nice top and the skirt very nice… the belt is fantastic, love it!!! enjoyed your blog, following you now, hope you could visit my blog too..kissess!!! you look wonderful! love this soft gray and pink mix! stunning outfit! What an amazing way to wear a belt! great jewelry! and maxi skirt looks so good on you! darling you look gorgeous! !you’re so classy and peaceful, plus you have such an amazing sence of style! !love your pics! !kisses my dear!! amazing outfit…you are so gorgeous…!! !love the sweater!!! thanks for your lovely comment! I love this combination of colours! perfect! wow! ce calumea arata cureaua prinsa prin plovar!! Si plovarul pufos cu fusta flowy :) Imi place mult! Also..La multi ani pentru maine! :) Sarbatoriti 1 Decembrie?